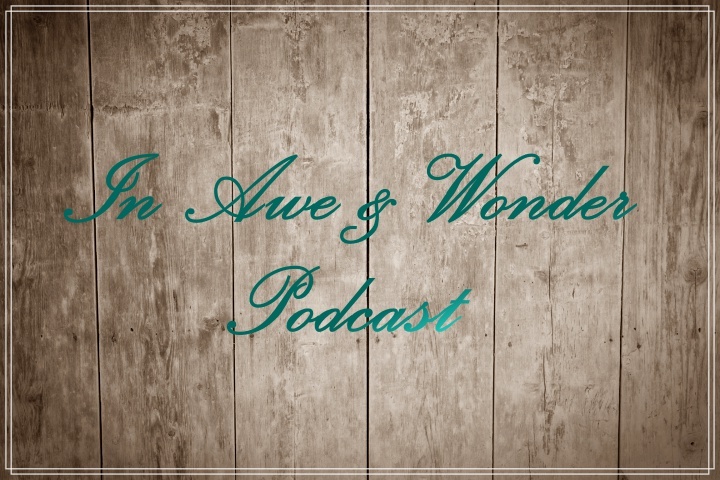 In Awe & Wonder Podcast! I apologize for some sections of poor audio quality. This is my first go at publishing a podcast and editing audio. I’m learning, so please bear with me. I likewise apologize for too many “um”‘s, “ah”‘s, “but”‘s, or “and”‘s. Hopefully I’ll get more polished and succinct as I record more. Welcome! I’d love to give the feeling via “podcasts” or audio on the blog that we are sitting down for coffee or tea together. I’m normally very quiet and do most of the listening, so to be on the spot for all the talking, there were some pauses and “um”‘s, as I processed through my thoughts. If we were actually getting together for coffee, I would for sure be letting you do most of the talking! It’s been a long while since I have posted a blog. Many changes and adventures have happened. We moved to Maine in 2015, starting off renting a house on the ocean and homeschooling our three girls. Then we bought a house and moved more inland. Last school year, two of our girls went back to school and I continued homeschooling our oldest. This year, all three are in school. I’m digesting the fact that I am now a mom of a teenager! Another change is spiritually. I have done a 180 degree turn in my theological and doctrinal beliefs. We began attending a charismatic church (unbeknownst to us) when we first moved to Maine. But due to disagreeing with many aspects of what they believe, I could not continue attending that church. We found a new one. In this process of getting back into the Bible, wrestling with some theological questions, and finding different preachers/teachers/music/podcasters to listen to, I have embraced the Doctrines of Grace and Reformed theology. Awe is everyone’s lifelong pursuit. God created an awesome world. God created you with an awe capacity. Where you look for awe will shape the direction of your life. Awe stimulates the greatest joys and deepest sorrows in us all. Misplaced awe keeps us perennially dissatisfied. Every created awe is meant to point you to the Creator. In the Tea & Scripture group, we are going to start studying 2 Timothy and also the book, Women of the Word, (affiliate link), by Jen Wilkin. I’ll be doing podcasts on the blog to go along with those studies. You can ask to join the Facebook group, where hopefully we will be discussing things further together. If not, you’re still welcome to follow along via the podcasts here on the blog. Thanks for stopping by! I hope we can learn and grow together! "But even if He does not..."
A Christian blog focused on faith, ministry, adoption, parenting, marriage, and more! Observations of a sinner seeking profundity in The Lord.